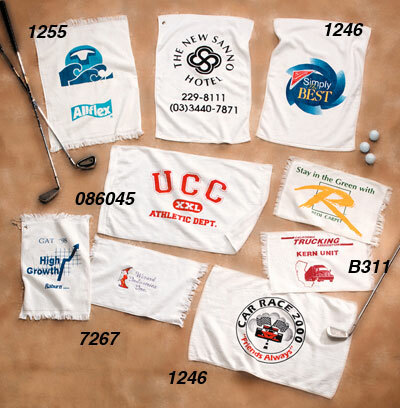 Custom Imprinted Golf Sport Towels at amazing low prices! Price Includes One Color Imprint. For extra colors, see price chart below. Screen charge: $40.00 per color, per design. We can custom print up to 6-colors at a variety of sizes. See price chart above for "Extra Colors" charge. Grommets and Hooks are available at $0.40 per towel. Embroidery is also available. Please call for prices. Golf and Sports towel size and imprint area:. 1255: Medium-weight velour/ terry Sports Towel - 16" x 25". Max. imprint: 12" x 24". 1246: Large Heavyweight velour/ terry Sports Towel - 16" x 25". Max imprint:12" x 20". 086045: Ultra-plush Heavyweight velour/ terry Sports Towel - 16" x 25". Max. imprint: 18" x 11 1/2". 7267: Heavy weight velour/ terry Sports Towel - 11" x 18". Max. imprint: 9" x 12 1/2". B311: .93 lbs. per dozen. Terry w/ fringed ends. - 11" x 18". Max. imprint: 8 1/2" x 12". Random sample: $14.50 each to cover cost, shipping & handling. • Bright, bold imprinted messages help promote team spirit for golf groups. • For promotional events or even School Sports!. Add $35.00 per color. Exact color match can not be guaranteed. Please provide black and white camera ready color separated (if needed) artwork to size. (No halftone artwork), or if you need artwork preparation, or to e-mail it to us, go to the following link. Requirements to prepare your artwork, or to e-mail it to us, click here. Packaging and Weight: Bulk, approximate LBS. From receipt of complete order and approved artwork, please allow approximate 15 - 20 working days production time in the plant on custom or imprinted merchandise, unless otherwise noted. Rush services available, add $40.00. Order your custom imprinted Golf - Sport Towels NOW and save time and money!